View Your Data Your Way, Instantly! 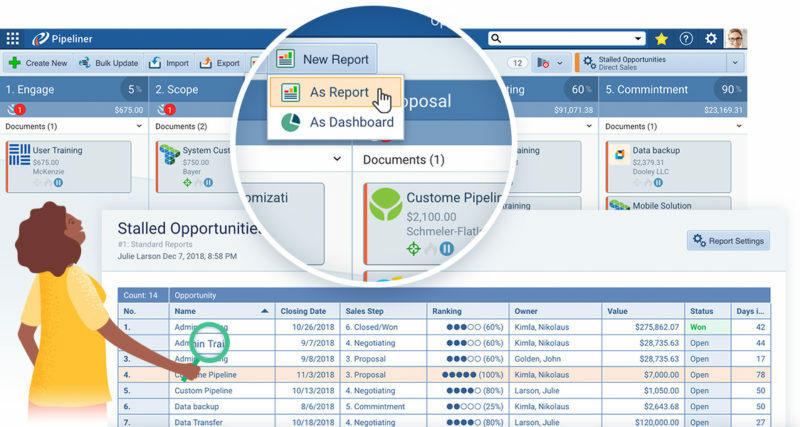 One of the most powerful features of Pipeliner CRM is the ability for all users whether salespeople, sales managers, admins or executives to personalize their experience. This is a huge limitation with traditional CRM systems where the type of data and how it is displayed is often predetermined by the system or by an all powerful administrator. 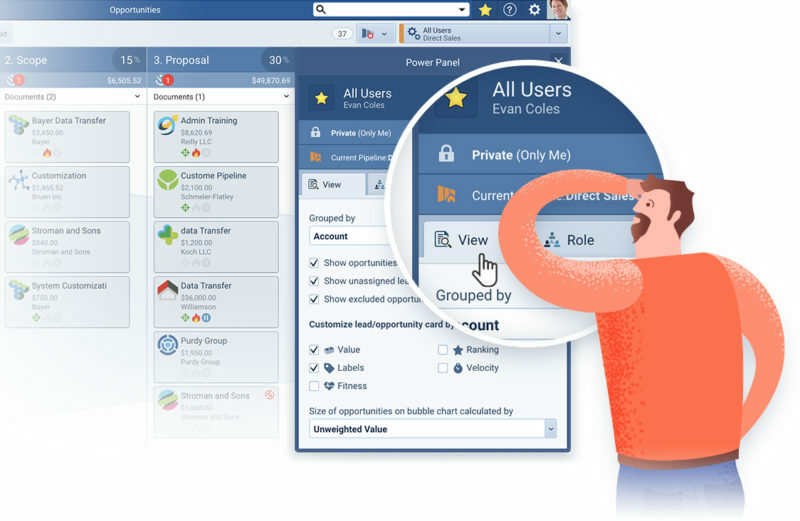 Not so with Pipeliner CRM where every user has access to the Profiles feature allowing you to personalize and customize the data you want to view. Never be overwhelmed by too much data again. For example as a salesperson you may want to focus on your highest-value opportunities which are in the later stages of the pipeline because month end is approaching. With the Profiles feature you can quickly create a view that only shows those opportunities and immediately you have a focused, uncluttered view – allowing you to see your data in the way you want to view it. Then you can save the profile so it is always available to you with one click and you can decide if you want this to be a private view that only you have access to, or a public view that all users can see or even a custom view that, for example, only you and your team or you and manager can see. 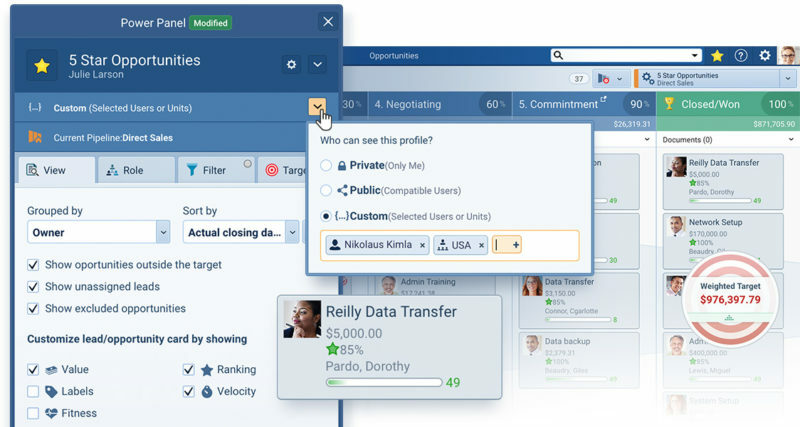 This kind of personalization and customization of data is unrivaled in any other system and reinforces the “what’s in it for me” for each user of Pipeliner CRM. The ability to share Profile views either publicly or with particular individuals or groups means everyone can be looking at the same data in the same way which is great productivity enhancer. For instance, a sales manager can create a Profile view that focuses on stalled opportunities in the team’s pipeline and then shares that view with the whole team. Now both sales team and sales manager can review the same data at the same time with one click. Everyone is on the same page and action can be taken quickly. This is how you can really make data work for you and not the other way around. But there is even more! A Profile view can immediately be turned into a report – yes with one click you can select the report type you want, name it and immediately you have a report. Plus that report inherits the share settings so everyone has access to that too (unless you decide to change it). 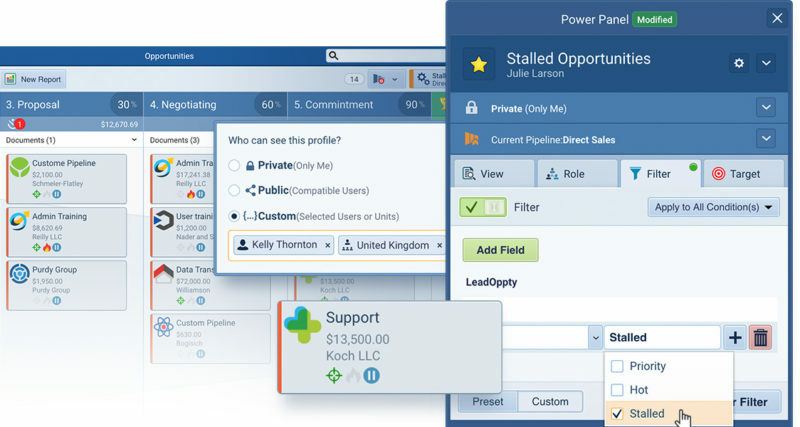 Whatever particular section of Pipeliner you are in the Profile feature is available to you (Leads, Contacts, Accounts and more) – this means you can truly customize and personalize your experience. Think about the time savings and the productivity gains of being able to click on a Profile you pre-saved and immediately have the latest data displayed. Other systems think allowing you to add a photo or change a color scheme is personalization whereas with Pipeliner CRM we know that real personalization is allowing you to choose what data you want to see and who you want to share it with.